Our caregivers have advanced training well beyond the basic level offered by other providers.Our unique training extends to the heart as well as the mind, helping us build a caregiving team that is genuinely committed to the best care possible. Because of our commitment to providing outstanding care, we’ve partnered with the Institute for Professional Care Education. The IPCed® approach uses an interactive and dynamic training mode, one proven to be more effective than traditional training. Our staff is our most important asset. We’ve chosen to invest in a training program that will provide you with the highest possible level of care available. The Institute for Professional Care Education’s interactive and dynamic approach is so effective that you will see the difference in care. That’s why we’ve chosen it – because your care matters most to us. For more information about the Institute for Professional Care Education, please visit them at www.IPCed.com. We are commited to providing the best possible care. This commitment begins with caregiving training. At The WaterLeaf at Land Park, one of our highest priorities is hiring people for their compassionate attitude, experience, and flexibility. But we know this isn’t all it takes to provide the best care possible. Caregivers also need excellent skills and competency. Not all training is created equally. 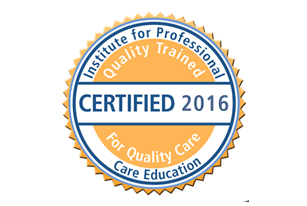 We use caregiver training programs developed by the Institute for Professional Care Education® to ensure that we provide quality training for quality care. Why are we so committed to training? A person who is specifically trained in his or her job will provide a consistent, higher level of quality care. When care is exceptional, customers are happier and more likely to recommend the service to their friends and neighbors. In fact, customers tell us that the best caregivers become invaluable to the family. Training increases employee retention. Great caregivers know their clients’ normal patterns well. When that caregiver leaves, a new caregiver may not notice when something isn’t quite right, resulting in unneeded hospital or emergency visits. High turnover results in increased health problems among clients and decreased satisfaction among family members. Many studies have shown that staff with more training feel better prepared to do their work. They feel better about themselves and their own skills because they are equipped to handle more complex and diverse care-giving situations. Employees will become the best they can be as long as they are presented with challenges and opportunities for growth. Companies that don’t train or provide poor training to their staff may become mediocre. We stand out from the rest by offering exceptional caregiver training opportunities. Why is our approach to staff training so important to you? Better trained staff means a consistently higher quality of care to you or your loved one. Because we have unlimited access to training courses, there is never any skimping on training due to cost. Training content is written by experts in the field of quality senior care, specifically for caregivers. Interactive and dynamic course presentation is fun and reinforces learning. Most importantly, it helps us build the best care team possible. Exceptional training for our caregivers means exceptional care for you.